In 2018, NASA plans to go prospecting at the moon’s south pole with a rover — possibly, a version of the Canadian one in the picture above. The idea is to look for water and similar substances on the lunar surface, with an eye to learn more about living off the land, so to speak. “The mission, currently planned to launch in early 2018, will demonstrate extraction of oxygen from lunar regolith to validate in situ resource utilization capability,” said NASA spokesperson Trent Perrotto in an e-mail to Universe Today. So that’s the background. Where does the rover stand in this? It would carry a payload called RESOLVE (the acronym stands for Regolith & Environment Science, and Oxygen & Lunar Volatile Extraction.) And the rover has already been through some field tests to see how well it performs in environments (fairly) similar to the moon. In 2009, for example, the Canadian Space Agency did a summer field study with NASA, Perrotto said. “The Canadian rover carried the RESOLVE payload during field tests. The tests helped NASA better understand the requirements of a volatiles-sensing payload, and helped CSA understand tele-operation and rough terrain exploration,” he wrote. At the time, NASA was working to get the payload ready for flight status in 2011, but the mission design has changed since then. The current design (called Resource Prospector Mission) would have RESOLVE, a Canadian Space Agency rover and drill, and a lander. NASA is now looking for somebody to work on the lander. “A request for information was released in July to identify industry interest in a partnership to develop the lander; and an announcement of opportunity is anticipated to be released in early December,” Perrotto wrote. This mission design is not a guarantee yet. For one thing, NASA is looking at rover alternatives and possibly getting a drill from a United States source instead. It also would depend on funding and agency priorities in the next few years. That said, however, the mission concept is proceeding right now. In September, Perrotto added, the CSA and NASA did “initial RESOLVE thermal and vacuum testing in September, including a test in [a] regolith-filled vacuum chamber at the NASA Glenn Research Center (GRC) at lunar temperatures and pressures.” RPM passed a mission concept review on Sept. 17 and is in the midst of a preliminary design review that would conclude in fall 2014. Representatives from the Canadian team also discussed the rover concept at the Canadian Space Society annual conference in Ottawa, Canada earlier this month. 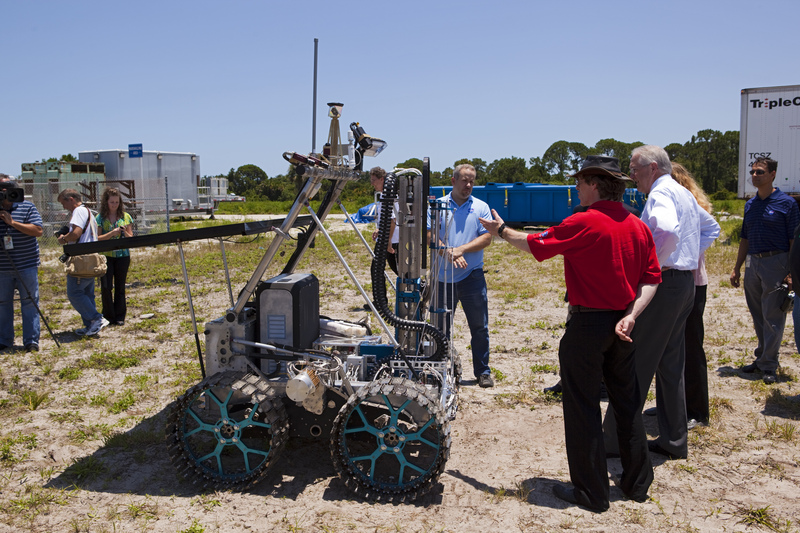 More information on RESOLVE is available on the CSA website; last year, the agency unveiled several rovers it developed for moon and Mars exploration.